I first met Kim who blogs at Sarah Lizzies back in 2013 during the Grow Your Blog Event. I have never read a more inspiring "teaching kids to quilt" post than her Once Upon a Time post, I hope you have time today you stop by Kim's and visit this lady who lives in the country and taught two clever little girls the creative fun to be had playing with fabric, lace, buttons and denim! Seriously, the self-esteem and pride Kim has instilled in these girls melts my heart. I adore this picture of one of the girls bedroom, with all her porjects proudly displayed and used!! You can read more about the girls progress in Kim's And the Fun Continues...post. Be sure to give the girls an extra big quilty hug from me today Kim. Their creative ideas are an inspiration today to many who live on the other side of the world! I have never worked with denim - a few bags, but a tag along quilt would be fun. Looking forward to visiting posts today. Such sweet denim quilt the girls made. I have made one from a Bonnie Hunter pattern. 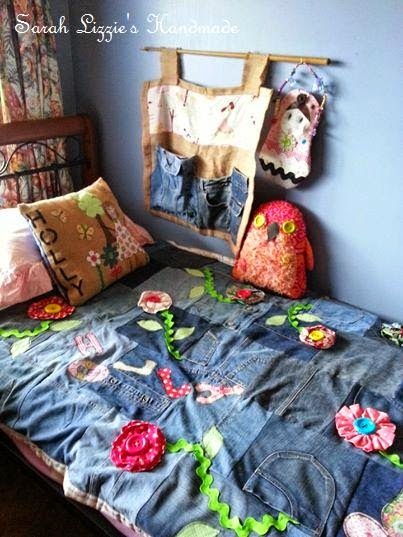 A great denim quilt. I love denim, happy to reuse old jeans. Hope to inspire with my links today. 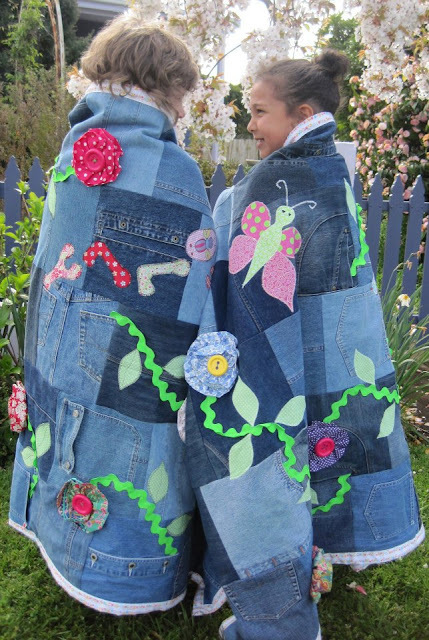 I have never used denim in my quilting projects although I have seen a few that I like. Thank you for sharing about Kim's posts Val! It's so wonderful to read about how she works with her kiddos. And maybe a reminder to us to nurture the joy found in being creative. The quilt were outstanding. Some cute projects too.